Evidence of light rail coming soon to the Eastside is hard to miss in Bellevue, as construction comes more together, with a bridge crossing I-405 and carrying on behind Whole Foods. But how are things looking beneath the surface? 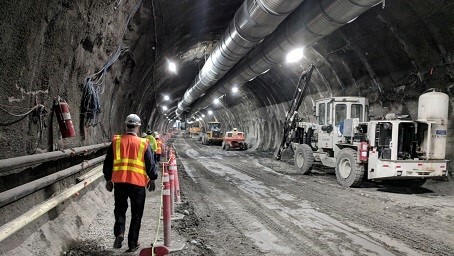 Sound Transit contractors recently completed the mining of the new tunnel under Downtown Bellevue for the East Link light rail line opening in 2023 and know were all curious to see how things are coming along. The Bellevue Downtown Association is excited to share Sound Transit’s Loyal to Local contest, rolling out at Downtown Bellevue’s annual Live at Lunch summer concert series. Seven lucky winners and a friend will win a private group tour of the tunnel in Fall 2018. As part of their Loyal to Local program to be good neighbors to businesses impacted by East Link construction, Sound Transit is holding a Twitter contest at the Virginia Mason Bellevue Medical Center Live at Lunch free summer concert series. Take a photo with the Sound Transit Loyal to Local Display at a Live at Lunch Concert on site Date. Post the photo to Twitter using the hashtags #LoyalToLocal and #SoundTransit. Each tweet counts as one entry, and you may enter the contest as many times as you like. Seven winners and a friend will be selected at random for a group tour in Fall 2018. Winners must be 18 years or older and able to navigate stairs and other obstacles in a construction site.